ConnectMe QR™ has created the perfect tool for groups with a collective interest. The ConnectMe QR™ Advanced Editor Mobile Platform can link and keep groups engaged and connected with immediate and relevant information. 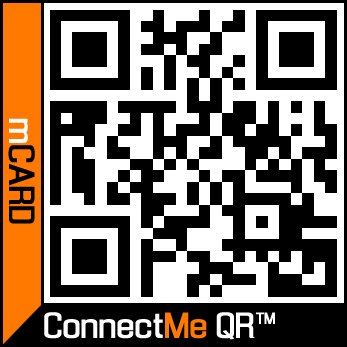 “I am pleased to say that 50% of my new business prospects can be tracked to my ConnectMe QR mCard. It’s an easy to use, cost effective, powerful marketing tool for any business. Mobile marketing company, ConnectMe QR™ is expanding its customer profile since launching their new Advanced Mobile Website Editor and QR code subscription service earlier this year. When they introduced their flagship product, the mCard™, focus was placed on pointing to subscribers’ social media and contact information. Now, with the Advanced Editor, users can customize their mCard™ (the mobile landing page that their ConnectMe QR™ code points to) by selecting from over 200 icons and entering their own text. These icons are links to information a subscriber wants someone to see when they scan their ConnectMe QR™ code. It can contain up to 9 links such as phone numbers, email addresses, YouTube videos, special coupons and offers, social media accounts, interactive location-based maps, etc. It is completely up to the subscriber. Network marketing companies, churches, professional associations, civic groups and direct selling industries – any group of people who share a common goal or interest all common need to improve communication within their circle. ConnectMe QR™ has created the perfect tool for groups like these with a collective interest. The ConnectMe QR™ Advanced Editor Mobile Platform can link and keep groups engaged and connected with immediate and relevant information. ConnectMe QR™ offers these home-based entrepreneurs a turnkey, mobile marketing solution that provides a new and unique channel for marketers to connect with their prospects or customers. With ConnectMe QR’s mobile marketing solution, network marketing companies and the direct-selling industry have the ability to post and distribute videos, update sales tools and printed materials that communicate the latest pricing, information and incentives. The mCard™ is built to be versatile enough to handle nearly everyone’s needs. The company encourages everyone to try their 30 day free trial, touting the fact that no credit card is required to try it out. Once the trial ends, the subscriber has the option to continue using the marketing solution for $4.99 per month without any contract. For more information about ConnectMe QR and its products, services and for group discounts call (877)365-4661 or visit online http://www.ConnectMeQR.net. ConnectMe QR™ provides Quick Response codes and editable mobile website marketing solutions for small businesses and individuals around the world. Since its launch in 2010, ConnectMe QR™ has continued to build upon its reputation as an innovator in the field of QR code mobile marketing. With the launch of their flagship product, the mCard™ (an around-the-clock, editable mobile website that you control the content for), ConnectMe QR™ has expanded small business's presence across multiple industries and around the world. For less than the cost that most people pay for hosting, ConnectMe QR™ offers a turnkey solution designed especially for home entrepreneurs, professional musicians, real estate agents, small business owners and large enterprises alike. This QR Code does more than send you to just one place!ConnectMe QR™ provides Quick Response codes and editable mobile website marketing solutions for small businesses and individuals around the world ConnectMe QR mCardAn editable mobile website where YOU control the content. Customizing your ConnectMe QR mCard is easy!